for the chocolate cupcake, could you use coffee in place of the water? Yes. Coffee would be good. In fact, my grandmother’s old “pioneer” chocolate cake recipe is pretty strange—it doesn’t use any eggs, but does call for a cup of boiling coffee right at the end. You cannot really taste the coffee, though; if you really want a coffee flavor in the cake, consider adding a tablespoon or two of instant coffee or espresso powder to the batter. Can i know boiling water here means hot water? Definitely so goods! Thanks for sharing and I wonder about how long to keep cupcake in freezer for? or how long to keep cupcake until it’s expired, somehow? I’m going to use this my wedding come up. I baked these yesterday and they turned out amazing. Anytime I try to bake cupcakes they come out dry. These were so moist. My fiance ate 7 yesterday! And he’s a small guy. But they were just so good. Then he ate 3 so far today. I on the other hand and trying to contain myself lol. As much as I want to eat 7. I know it’ll back fire. Thanks for the recipe. I was a bit nervous with adding the water. But turned out great!! Has anyone tried these with butter instead of vegetable oil? I hate using oil in my baking!! Wow. Just WOW. These came out fantastic! Not perfect, but that’s not the recipe, my baking soda and powder were not as fresh as they should be, didn’t rise too well. But taste-wise, fantastic! Plus I used the chocolate cream cheese icing (which I’ve been making forever, but never chocolate version) Double Bomb Good! Only thing I was worried about was the consistency of the cupcake batter… You say thun, but mine was so thin it looked like hot chocolate… I thought for sure they wouldn’t bake right. I was pleasant surprised! I’ll probably not use a box mix again. Well, maybe. But this was really just as easy, so silly to buy boxed… Now I need to try the other batter recipes as my hubby doesn’t like chocolate… these were made special for a friend’s birthday. And we really love chocolate, so… Thank you so very much! 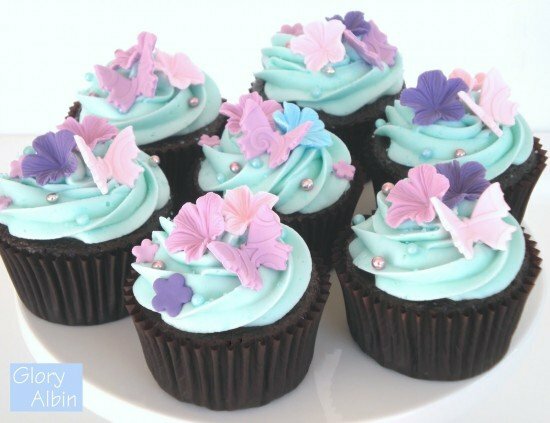 These really are the PERFECT chocolate cupcake! I’ll never use another recipe. Thanks so much for sharing! 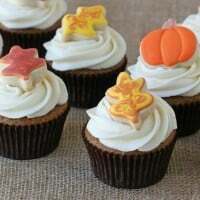 I made these a while ago with gluten-free flour for my mom and also experimented by decorating with your buttercream frosting recipe. They were SO delicious!!! Thank you for sharing! This cake was lovely .It was soft , moist and delicious just like a boxed mix .I recommend to increase the cocoa powder to 1 cup and sift the dry ingredients together into the bowl.after using this recipe I will never use a boxed mix again!!!! Hello. I am trying your recipe. I know you said it is normal for it to be thin but exactly how thin? because mine is very runny. Yes, the batter will be very thin. 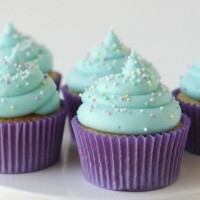 I generally pour the batter into a large (2 or 4 cup) measuring cup with a pour spout, and pour it into the cupcake papers from the measuring cup. I made these cupcakes for my friend’s baby shower and they turned out really perfect as the name suggests. These were an instant hit with the party. Thank u for this wonderful recipe. My husband loved them and he is not a chocolate lover. Can I substitute the boiling hot water for one cup coffee? The only reason I made these cupcakes was because my 6-yr old son wanted to make Chocolate cupcakes. After searching a few options, I figured I’d look for a recipe on Pinterest since I’ve previously had success in doing so. Can I say oh what a winner! I have always been a chocoholic since I was a little girl and I’m happy that my son inherited my love-chocolate gene! I used Hershey’s special dark cocoa and the richness with the chocolate cream cheese icing is absolutely amazing. My husband, who is a food snob had 2 immediately and is begging me to take them out of the house before he eats them all! Thanks so much for sharing this! It will surely make the Thanksgiving menu this year! cupcakes One of my favourite cakes in my sister’s recipe . I always make an sort of extra fruity version of it as a Xmas cake. i just made these for a baby shower. I used coconut oil instead of vegetable oil. YUM!! The frosting is awesome too! Thanks for sharing. Hi….My family and I totally love this recipe. Thanks so much! !!! I’m having a small problem though. I have used this recipe to make an whole cake, however the cake gets stuck to the oven pan. Please tell me what to do to stop this from happening???? Because just the top layer peels of and the rest be stuck to the pan and the cake ain’t burnt or uncooked. Honestly don’t know what is wrong!! Hi! I have made this recipe for years. Yes the bottom of the cake sticks to pan because it is really moist. What works for me is lining the bottom of the pan with some baking paper. Hope it helps you! My family and I totally love this chocolate cupcake recipe. I only have a small problem!! Instead of making cupcakes I have made a chocolate whole cake. My problem is that the cake gets stuck to the pan even though the cake is not burnt or uncooked. Really makes me dissappointed and I don’t know why this is happening. Try greasing the sides of the pan and then putting flour in the pan as well or grease and like. With parchment paper or just line with parchment paper. My daughter made this, they are super moist and very yummy. Just wanted to know if the cupcakes can be frozen? No. You can try to use lesser-fat milk if you wish, but the results will not be the same. Do not use buttermilk as it will add too much acidity to the batter. I made these and substituted the whole milk for buttermilk and added a tablespoon of instant coffee to the boiling water for that mud-cake type feel! Delish! so amazing! was nervous about the water but turned out beautiful and chocolatey! defienetly making these thousands of times! Yay, so glad you had the faith to give it a try as listed! They are definitely a favorite in our house! I just made this for Mother’s Day tomorrow and had a little batter left so I put it in a small, heart pan and had it with some butter on it while it was warm….YUM!!!!! I used 1% milk since that was what I had. I will make these again! Yay, so glad you enjoyed the recipe! Thanks for your sweet comment! Sorry to hear you didn’t have success with this recipe. It’s very difficult for me to know what went wrong without being with you in the kitchen. The cupcakes should rise nicely. I would suggest making sure your baking powder and baking soda are fresh. I’ve never made the recipe with a dairy free milk substitute, but I think it could work. Generally if a cake or cupcakes collapse after you’ve removed them from the oven it’s because they were not fully baked. 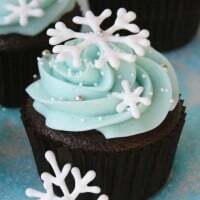 Be sure to test one cupcake (with a toothpick inserted in the center) to make sure there is no wet batter before allowing the cupcakes to cool. I want to make this as a cake recipe. A double layer 9 inch…any ingredient changes..how about Cooking Time? I plan on baking Friday,freezing and frosting Sunday for party. Yes, you can make this recipe into a double layer 9 inch cake with no ingredient changes. Cooking time will depend on if you bake the cake in two pans or one and the quality (thickness) of your pans. The cakes are done when they appear cooked on top (no visible wet batter) and the tops have a slight dome. Test with a toothpick inserted in the center, which should come out clean (or with a few crumbs, but no wet batter). 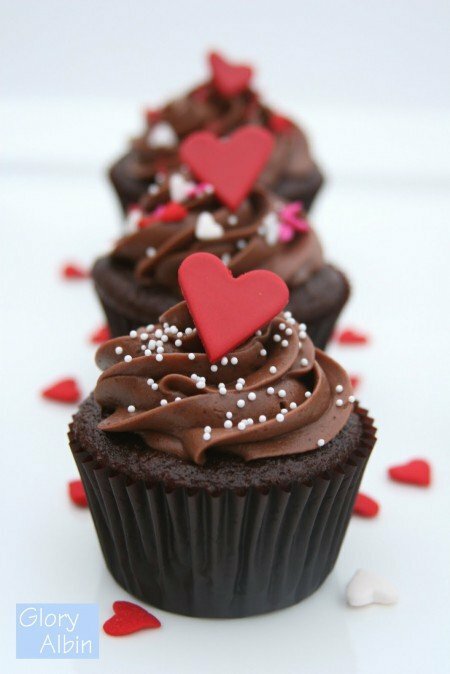 Thank you for sharing this recipe it’s my go to for chocolate cupcakes, moist and delicious. I prefer to use Dutch process cocoa, but am finding the cupcakes sink in the middle. Do you have a conversion on the baking soda and baking powder if using Dutch cocoa? Or would it help to use buttermilk instead of whole milk when using Dutch cocoa? Thank you. I loved this recipe! 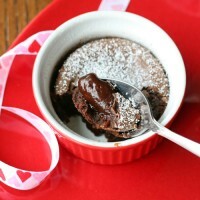 I’ll be reposting this recipe on my blog for others to enjoy (with sources to you and Hershey). I added coffee grinds into the recipe, about 1 tbsp (as mentioned above) and they turned out perfectly! The texture, the flavour– love it. We paired it with cream cheese frosting. Thanks again! Just made these for my son’s birthday party- I got so many compliments! Hands down the best cupcake recipe I’ve ever used. Thank you! I made these for a Christmas bake sale. Notice that all the photos have dark cupcake liners. If you use light colored liners, this very liquid-y batter stains the liner dark. I added a second liner after the cupcakes had cooled to cover up the stain. Delicious recipe. Hi! I need 24 cupcakes for my daughter’s birthday. Since your vanilla recipe only makes about 15 I thought I would do your chocolate as well but it already makes 24 which would be way too many extra. Can I halve the chocolate recipe? Thanks! I made this cupcake today and for the first time, I made my first cupcake perfectly. very moist and very delicious too! I think i’m starting to love baking because of this experience. Next time I wanna try the vanilla recipe. and many more recipes to come. Oh My Word!!!!!!!!!!!!!!!!!!! First time attempt to make chocolate cupcakes and I am so proud to say they came out very perfect. Crispy at the top, fluffy and soft on the inside. This recipe is so moist and good! However most of the time my tops come out flat and i dont know why….any ideas? I use a flat head not a whisk on my stand mixer and tried not to over beat it. Thank you! Hi, do you have a vanilla recipe just like the chocolate cupcakes? These are seriously so so good!! I believe the key ingredient is the boiling water. Wondering if I can bake n frost then put in the fridge overnight for my sons party the next day? Or should I frost the day of the party? Thanks! Can I substitute the all purpose flour with cake flour? We do not have all purpose flour where we live. Made the vanilla cupcakes, amazing ! I love this recipe! 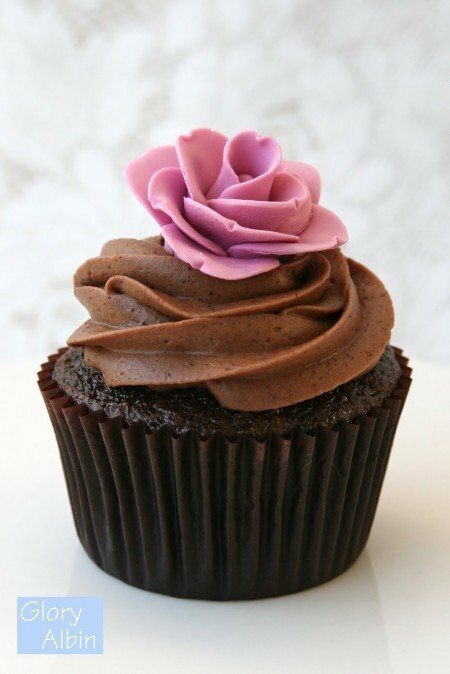 It’s my go to for chocolate cake or cupcakes! Thank you. What do you think would happen if I used Bailey’s instead of milk? ?